Consumer energy efficiency programs (often funded by utilities) now cost about $5 billion per year, and most of the money goes to subsidies for consumers to purchase energy-efficient appliances. Of course, there are also subsidies for purchasing certain kinds of fuel-efficient cars. Are these subsidies for consumers a cost-effective way of encouraging the purchase of energy-efficient appliances? Presence of Existing Policy (Discussion Paper 14-34, September 2014). A readable overview of their results in the RFF blog is here. However, in the most recent issue of Resources magazine from RFF, Richard Newell and Juha Siikamäki investigate, "Can Product Labels Nudge Energy Efficient Behavior?" The working paper offering the detailed analysis behind the article is available here. They find experimental evidence that what specific information is presented on the label of energy-efficient appliances can make a large difference in consumer perceptions. Let's take a quick look at these results. The analysis of the cost-effectiveness of subsidies for energy-efficient appliances turns on dividing appliance purchasers into three categories: 1) some people are just going to buy the less efficient appliance, which often costs less up front; 2) some people are just going to buy the more energy-efficient appliances, either because of the longer-term cost savings from lower energy use or because they want to do so; and 3) some people are "switchers," who would have bought the less energy-efficient appliance, but because of the subsidy, switch over to the more energy-efficient appliance. Of course, those who would have bought an energy-efficient appliance even without a subsidy are likely to favor the subsidies. For them, it feels like free money and a reward for virtuous activity. But from an energy conservation point of view, subsidies going to this group are all cost and no benefit--because these people would have bought the energy-efficient appliance anyway. The only energy conservation benefit comes from those who actually switch as a result of the subsidy. We estimate that the ratio of “switchers” (individuals who switch from a non–Energy Star to an Energy Star–rated appliance as a result of the rebate) to “freeriders” (individuals claiming rebates who would have purchased an Energy Star-rated appliance even in the absence of the rebate program) is 1:10, 1:12, and 3:8, for refrigerators, clothes washers, and dishwashers, respectively. As a result, the cost per kilowatt-hour saved is on the order of about $0.25 to $1.50, depending on assumptions and appliance category. The low end of this range is four times the average cost-effectiveness of utility-sponsored energy efficiency programs. In short, giving consumers a rebate for purchasing energy-efficient appliances isn't a cost-effective way to reduce energy use, because too much of the money goes to those who would have bought the energy efficient appliance anyway. They they experiment with presenting less information, and presenting different information. They survey a group of about 1,200 households who were randomly offered different labels and prices for water heaters. For economists, the issue here is the extent to which people are willing to take long-term costs in energy savings into account when they think about purchasing an appliance. 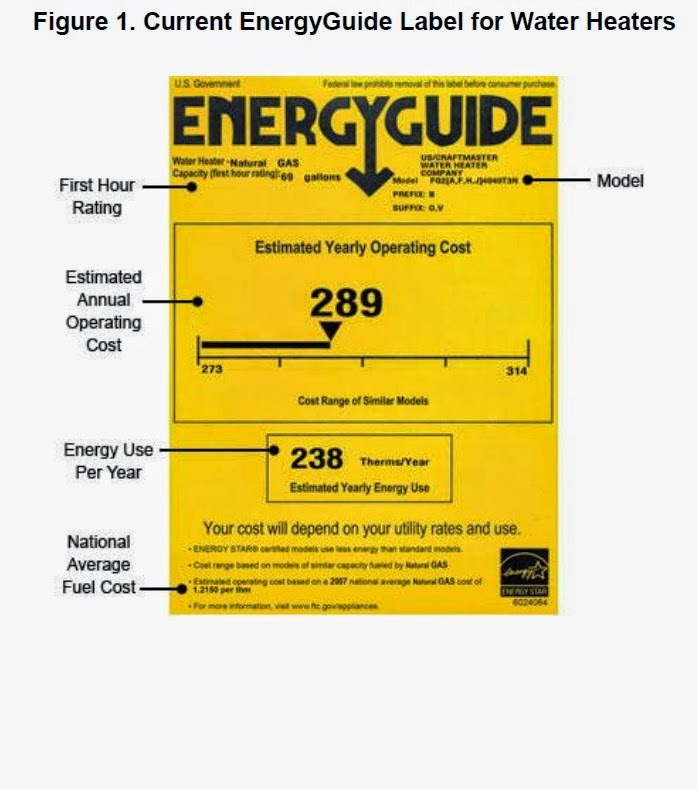 You can find specific details in the articles, but basically, the standard label did a pretty good job: on average, those who saw the label also perceived the long-run energy savings accurately. Perhaps not surprisingly, of the various elements on the label, the basic information on yearly operating cost had the biggest effect. However, if the policy goal was to encourage even further energy conservation, Newell and Siikamäki offer a couple of options that make people pay greater attention to the energy savings: for example, one approach is to add the EnergyStar logo and label to the standard information. 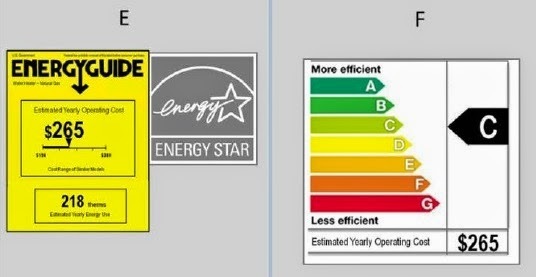 Another approach, commonly used in the European Union, is to offer a colorful label that shows a range of "grades" for energy efficiency, and where this appliance stands in the range. It's important to remember that the Newell and Siikamäki results are based on surveys of consumers, not on actual purchase decisions, so some further research is needed here. Still, the existing evidence strongly suggests that if the goal is greater energy efficiency for consumer appliances, the useful policy tools are setting minimum standards for energy efficiency and requiring labeling about energy efficiency that will catch the eye of potential buyers, while paying rebates to buyers of such appliances is money that could be better spent in other ways. Across the high-income countries of the world, about one student in eight will have repeated a grade before reaching age 15. Does it do any good? 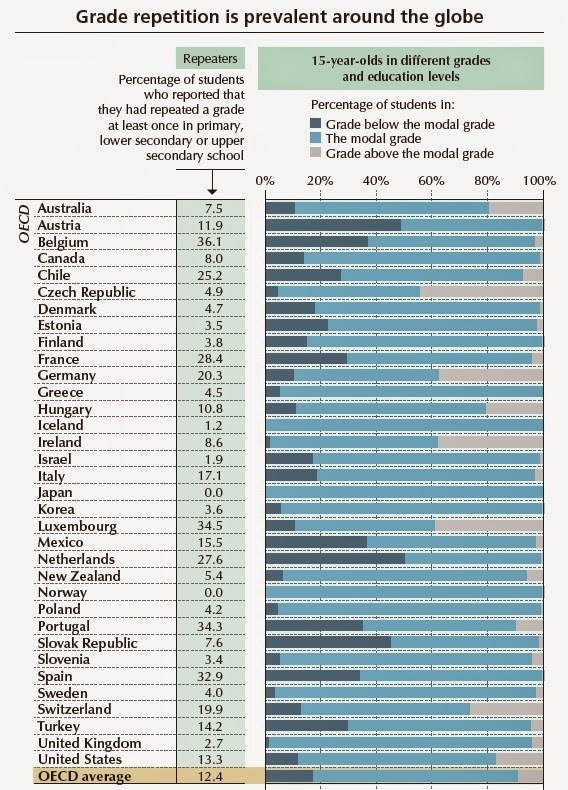 The OECD assembles some of the evidence in "Are disadvantaged students more likely to repeat grades?" published in PISA in Focus (September 2014). There's also a readable overview at the OECD blog here. For starters, here are some basic statistics about the amount of grade repetition across countries for the OECD countries. Some European countries which stand out with especially high rates of grade repetion include Belgium, Netherland, Portugal and Spain. The U.S. is roughly at the average for OECD countries. A number of other countries including Korea, Sweden, and the United Kingdom hold back students at less than half the average rates. 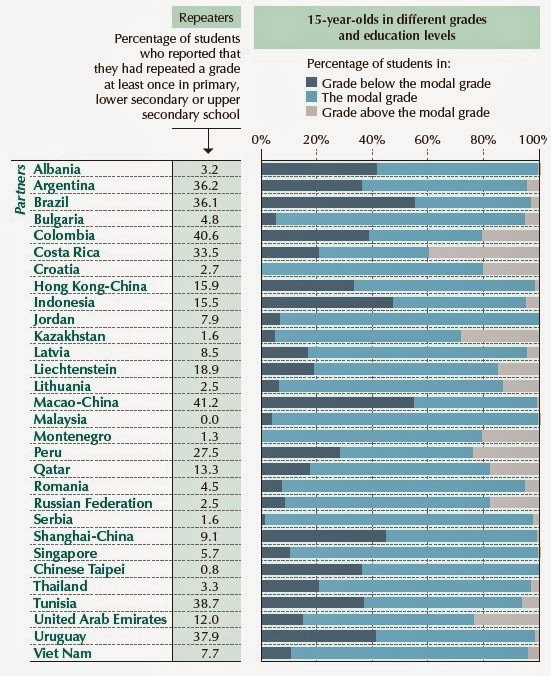 The report also collects data on grade repetition for a number of other countries. What jumps out at me in particular is the prevalence of grade repetition in many Latin American countries, where the share of students who have repeated a grade is often over one-third. In practice, however, grade repetition has not shown clear benefits for the students who were held back or for school systems as a whole. And grade repetition is a costly way of handling underachievement: retained students are more likely to drop out, or to stay longer in the school system and spend less time in the labour force. As a result, some countries that had used grade repetition extensively have rejected that policy in favour of more intensive early support for struggling students. Among the 13 countries and economies that had grade repetition rates of more than 20% in 2003, these rates dropped by an average of 3.5 percentage points by 2012. Moreover, the choice of which students are held back and which students get alternative forms of help seems to be heavily influences by socioeconomic factors about the family of the student. Here's a figure showing how often students in the bottom 20% of a measure of socioeconomic status are held back a grade--after adjusting for any differences in math, reading and science test scores. (The dark green bars mean that the difference is statistically significant.) The report notes: "In Portugal and Spain, for instance, when comparing a group of disadvantaged students to an equally proficient group of advantaged students, there are three times more repeaters for every non-repeater in the disadvantaged group than in the advantaged group. On average across OECD countries, disadvantaged students are 1.5 times more likely to repeat a grade than advantaged students who perform at the same level." The bottom line: Grade repetition may not only be ineffective in helping low-achieving students overcome their difficulties at school, but may also reinforce socio-economic inequities. Providing extra teaching time for students who fall behind, adapting teaching to their needs so that they can catch up with their peers, and targeting these efforts where they are most needed is a much better way of supporting students with learning difficulties or behavioural problems. About 1.2 billion people around the world have a consumption level of less than $1.25 per day, and 2.4 billion have a consumption level of less than $2 per day, according to the World Bank. One standard policy prescription has been to try improve the standard of living for this group through foreign aid. Indeed, the higher-income nations of the world gave $134.9 billion in official development assistance in 2013, according to the OECD. One can argue that foreign aid should be higher. 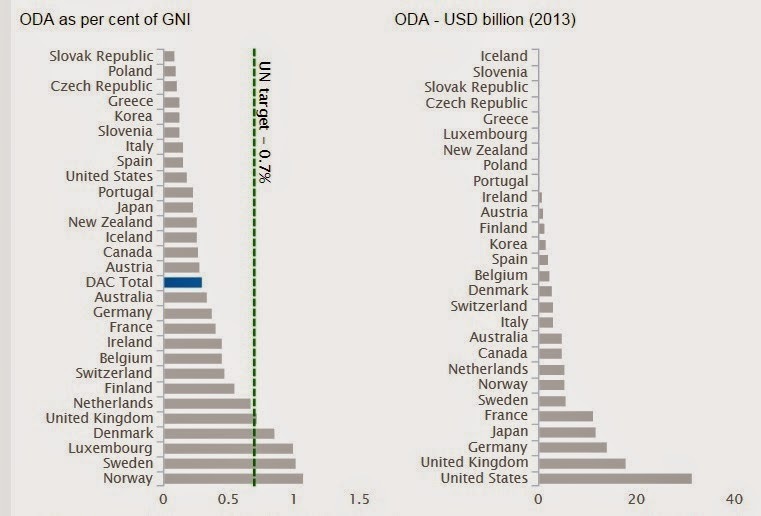 The OECD some years ago set a target that high-income countries should try to give 0,7% of GDP in foreign aid, but few countries meet that target, and the average (as a share of GDP) is about half that amount. But a bigger problem for foreign aid is suggested by long division: Take $134.9 billion in aid and divide it by 2.4 billion people consuming less than $2 per day, and it works out to about $56 per person. Even if effectively administered and invested, that amount of aid isn't going to budge the needle on global poverty by very much. Thus, it's natural to ask what high-income countries might do, other than tweaking their foreign aid budgets, to help the world's poor. A committee in the UK House of Commons is apparently seeking to compile a policy agenda along these lines. Owen Barder and Theodore Talbot of the Center for Global Development drew up a memo for the House of Commons committee. The memo is here; a blog post about the issue at the CGD website is here. Here's a sampling of their policy proposals to help the world's poor that go beyond the foreign aid budget (with many citations omitted for readability). in exports from eligible African countries of around £299 million a year." "Data from 2007 shows that twenty-five of the forty-four countries in sub-Saharan Africa were experiencing crippling power shortages. Power cuts reduce annual growth rates of the worst hit African economies by over 2%. Transport is also a serious problem. ... [T]he annual funding shortfall for low- and lower middle-income African countries is estimated at nearly £27 billion per year to overcome the current infrastructure gap within a 10-year period. For developing South Asia, Andrés et al. (2013) estimate a £1.4 trillion dollar infrastructure gap over the next decade. ... Tackling illicit financial flows (IFFs) could help governments in poor countries meet more of their own needs. These flows include tax evasion (like firms underreporting export values to lower their tax bills), theft of public assets and related corruption, the laundering of the proceeds of crime (like drug sales), and a range of market and regulatory abuses under cover of anonymity (like hidden connections between politicians regulating an industry and the industry itself). Illicit flows, by their nature, are difficult to measure, but all studies put total costs in the billions annually. According to one estimate, twenty Sub-Saharan African lost an estimated 10% or more of their cumulative GDP produced between 1980 and 2009 to these outflows. "About 60% of global income inequality can be explained simply by which country people live in: one of the most effective ways to raise incomes of poor people would be to allow more people to choose what country to work or reside in (even temporarily). ... Research on the US labour market by the Center for Global Development (CGD) shows that workers from Paraguay or Turkey, for example, could triple their monthly wages, while workers from poorer countries like Cambodia or Ghana could earn nine times more purely by working in the United States. By contrast, there is no aid-funded project that would raise a workers income from £60 to £540 per month. Furthermore, migration, unlike aid, directly adds value to rich countries’ economies." "The fisheries sector of African countries was worth more than £10.6 billion in 2011, equivalent to over 6% of African agricultural GDP, and net fisheries exports from all developing countries reached £21.4 billion in 2012. However, two thirds of the North Atlantic fish stocks and 82% of Mediterranean stocks are overfished. Fisheries can be a renewable resource only if they are carefully managed. ... Despite the catastrophic risks to fish stocks of overfishing, the EU continues to subsidise engine replacement for vessels larger than 24 meters while half of the EU’s distant-water fleet makes its own arrangement with third countries. Weak government capacity in developing countries increases the chance of fishing past sustainable yields." "Tighter controls on intellectual property ... are part of the reason that developing countries have not been able to close the gap on industrialised countries. Facilitating private investment is an important piece of this puzzle. Foreign firms that operate overseas increase the productivity of their suppliers and customers, train workers who can then migrate to other firms in the same sector with new skills, and demonstrate models that other firms can copy. Rich countries can also make the global pool of knowledge available to poor countries by targeted improvements in their intellectual property rights (IPR) regimes for developing countries." "Conflict and insecurity have appalling human costs. In addition they also have longer-run effects on economic growth by destroying productive capital and reducing the incentives for firms and households to invest. Collier (1999) estimates that countries in civil war experience a decline in growth of 2.2 percentage points, and other estimates are significantly higher. ... The UK requires an approved export permit for arms sales or exports of technologies, like cryptographic equipment, that have a dual civilian and military use. Despite this safeguard, a report by the Committees on Arms Export Controls (2013) found 3,375 arms export licenses worth nearly £12 billion to countries on the Foreign and Commonwealth Office’s (FCO) list of countries of human rights concern, including Iran, Russia, Sri, Lanka, Belarus and Zimbabwe. In the same period, the government rejected 148 applications (1% of approvals). ... Peacekeeping missions are a cost-effective contribution to promoting stability overseas." Of course, people will differ on which options are likely to be have the biggest effects for the world's poor and which options are politically feasible in high-income countries. But if you think that alleviating global poverty is a worthwhile policy goal, some combination of the items on this list can have an effect that is a hefty multiple of what foreign aid is able to achieve. a day, according to the consulting firm Deloitte. By comparison, Visa’s electronic payment processing network handles more than 150 million transactions a day from 2.1 billion credit cards and more than 2 million ATMs." But Bitcoin has come to represent the possibility of an alternative way of thinking about money. In a conventional financial system, money is in bank accounts, and payments transfer money between accounts. To put it another way, the transaction relies on the fact that the bank can see what people have in their accounts. In a Bitcoin transaction, no third party can see what the buyer and seller have in their accounts; indeed, no third party can name the two parties that are making the transaction. People can buy and sell anonymously, without the interposition of a conventional currency or the control of a central bank. But through what magic of cryptography can such a system work? One of the best explanations I've seen of how Bitcoin actually works in a nuts and bolts way is by Robleh Ali, John Barrdear, Roger Clews, and James Southgate, who have two articles in the Quarterly Bulletin of the Bank of England (2014, Q3) that offer a nice overview: "Innovations in payment technologies and the emergence of digital currencies" and "The economics of digital currencies." Here's a step-by-step sense of how a Bitcoin transaction works, drawing from their essays. Step 1: Two parties agree on a Bitcoin transaction. For simplicity, call the buyer Anne and the seller Bill. to pay each one." The message can also include other conditions: for example, Anne may specify that she is willing to pay a small amount to the party that verifies the transaction--a step to be discussed further in a moment. private keys are random strings of alphanumeric characters. An address is typically 34 characters long (for example 1FfmbHfnpaZjKFvyi1okTjJJusN455paPH), while a private key is typically 51 characters long. Each Bitcoin address is paired with a corresponding private key, which is kept secret by the owner of the address, and needed to sign transactions from — and, hence, prove ownership of — the address." Step 4: "Anne broadcasts the signed message to the network for verification." At this point, Anne has created an anonymous "buy" message, and the issue is how to verify that the funds should indeed be transferred. Stage 5: "Miners gather Anne’s new transaction and combine it with others into new candidate ‘blocks’. They then compete to verify them in a way that other miners will accept." Let us postpone for a moment the notion of "blocks" and how the miners compete to verify the transactions, and just say that Claire is the miner who succeeds in verifying Anne's transaction. The transaction is then completed in one more step. Stage 6: "Clare is a miner and successful at verifying a block with Anne’s transaction in it, so she will receive both a reward of new bitcoins, as well as the transaction fee from Anne’s transaction. Clare broadcasts this result and other miners add the block to the end of their copies of the block chain and return to step 5. Bill receives the 1 bitcoin sent to him ..." Notice that Bill now has a Bitcoin in his account, which he could use to initiate a transaction of his own. The rule that the chain with the greatest sum of work done wins is an important element in combating fraud in the Bitcoin network. Any attacker attempting to modify earlier blocks (so that bitcoins could be spent twice) would have to control enough computing power for them to both catch up with and then overtake the genuine block chain as the ‘longest’. ... It therefore makes more sense for anyone capable of assembling the necessary computing power to contribute to the continuation of the system, rather than attacking it. This seems more-or-less clear, and the point that Bitcoin transactions are not instantaneous strikes me as especially interesting in our credit-card economy. But there are two big holes remaining in the explanation. What exactly is the work done by the miners? And how are the miners rewarded for doing it? • A reference to the previous block. • Details of their candidate block of transactions. • A special number called a ‘nonce’. If the hash value produced is below a certain threshold, the proof of work is complete. If it is not, the miner must try again with another value for the nonce. Because there is no way to tell what value of the nonce, when combined with the other two inputs, will produce a satisfactory hash value, miners are forced to simply cycle through nonce values in trial and error. Outsiders can verify how much work it takes to get an acceptable hash value: that is, how many values of the nonce must be tried. Again, the one that took the most work is accepted as the basis for the block chain on which others will build. to 12.5 bitcoins per block in 2017. The planned eventual total number of bitcoins is therefore 21 million, which will be mostly reached by 2040. There are currently a little over thirteen million bitcoins in circulation, distributed over perhaps one or two million users worldwide. ... The Bitcoin protocol seeks to maintain a roughly constant time of ten minutes between each successfully verified block." to have precisely pegged the cost of the electricity to run—and cool—the computers that solve the algorithms, but estimates run up to $15 million a day." The discussions in these articles tackle many other issues. What are some pros and cons of anonymous money? What would happen if someone started a Bitcoin bank? Might some small country set up its own currency in a Bitcoin style, and seek to attract those who desire such a currency? If law enforcement and governments wanted, could they find ways of tracking the flow of Bitcoins? What are the risks for fraud? What would competition between different Bitcoin-like currencies look like? If Bitcoin becomes more important, so will these kinds of questions. But here's one final thought. 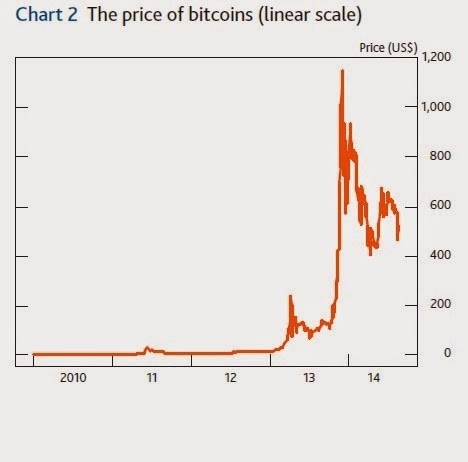 The price of Bitcoins spiked in early 2013 and then even more in late 2013, and has since then fallen by about half. Watching this process casually, it seemed to me like evidence of grievous instability in this currency. Here's the pattern. But it turns out that this is an interesting example where having the vertical axipresented as linear, rather than logarithmic, alters ones perceptions considerably. 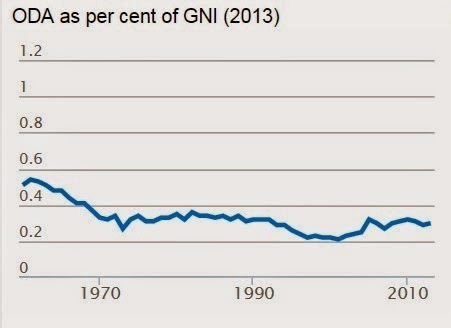 (A logarithmic graph rises in percentage terms. Thus, a continual percentage increase over time looks like a curved line on a linear graph, but like a straight line on a log graph.) 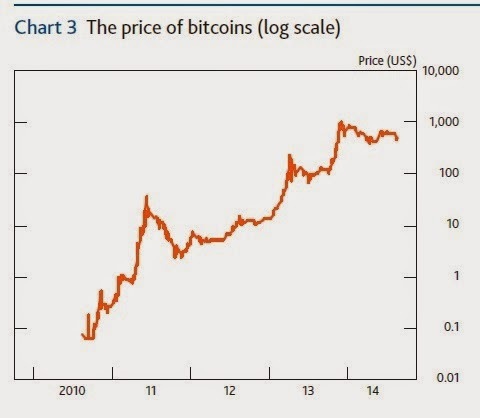 Here's the price of Bitcoin on a log graph. It's still bumpy, but it now looks a lot more like a reasonably steady (if volatile) upward movement, not at crazy cycle of boom and bust. Right now, people are experimenting with Bitcoin for a lot of reasons: pure novelty, anonymous transactions, getting some experience with this kind of transaction, and so on. But given that the ultimate supply of Bitcoins is fixed, their value will ultimately be determined by the demand for their use in transactions. In 2012, nearly 16 million U.S. children, or over one in five, lived in households that were food-insecure, which the U.S. Department of Agriculture defines as “a household-level economic and social condition of limited access to food.” Even when we control for the effects of other factors correlated with poverty, these children are more likely than others to face a host of health problems, including but not limited to anemia, lower nutrient intake, cognitive problems, higher levels of aggression and anxiety, poorer general health, poorer oral health, and a higher risk of being hospitalized, having asthma, having some birth defects, or experiencing behavioral problems. The underlying data here comes from survey answers to the Current Population Survey, a nationally representative survey done each month by the U.S. Census Bureau. The survey includes a module about food and hunger in households. Examples of questions include: “Did you or the other adults in your household ever cut the size of your meals or skip meals because there wasn’t enough money for food?”; “Did you ever cut the size of any of the children’s meals because there wasn’t enough money for food?”; and, the most severe item for households with children, “Did any of the children ever not eat for a whole day because there wasn’t enough money for food?” .... Children are experiencing food insecurity if at least two of the eight child-centered questions are answered in the affirmative, and very low food security if five or more such questions are answered positively. households. This suggests that income is only part of the story and that other factors also contribute to children’s food security. As the authors dig into the data on children living in food-insecure households, the theme that keeps emerging is the quality of parenting the children receive. Here are snippets from the report, taken from a number of different studies. The takeaway lesson, at least for me, is that food stamps and school lunches do help to reduce food insecurity, as do programs that provide income support to those with low incomes. But when the adults in a household are having trouble managing their own lives, children end up suffering. The answers here are straightforward to name, if not always easy to do, like finding ways to get food to children directly (perhaps by expanding school food programs to the summers and weekends) and to help parents in low-income households learn how to stretch their limited resources. As I have argued before on this website, for many children, the parenting gap they experience may be limiting their development even from a very young age. If you're trying to get someone to start a project with long-run payoff, it's can be useful to point out that the project also offers clear short run gains. In that spirit, there is a strong case that the world's leading emitters of carbon should be looking for ways to reduce their use of carbon-based fuel solely for the short term benefits--even before taking the risks of climate change into account. 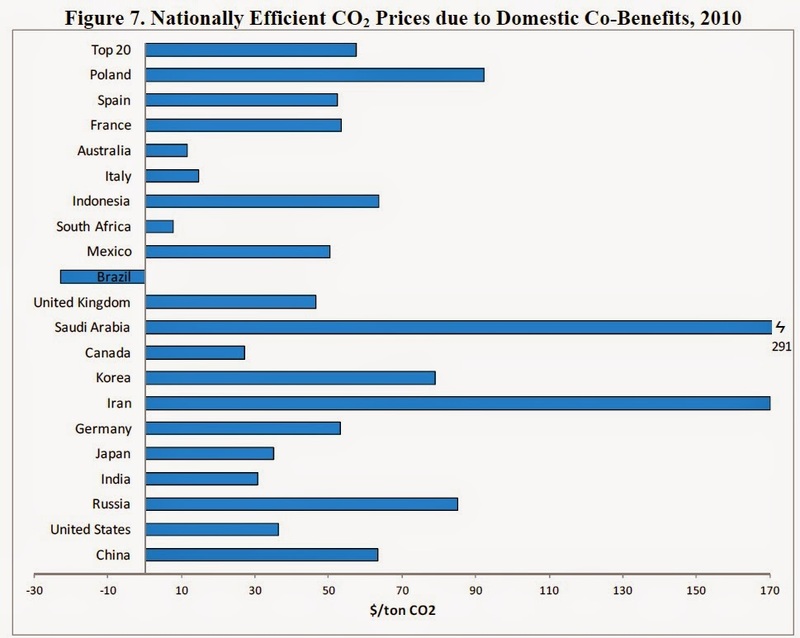 Ian Parry, Chandara Veung, and Dirk Heine make this case in "How Much Carbon Pricing is in Countries’ Own Interests? The Critical Role of Co-Benefits," just published as IMF Working Paper WP/14/174. Parry also offers a short and readable write-up of the results at the IMF blog. The main insight here is that burning fossil fuels has a variety of more immediate health costs: for example, it typically evolves emissions of sulfur oxides, nitrogen oxides, and particulate matter. In addition, there are a variety of social costs of fossil fuel use in the transportation sector, including costs of traffic congestion and accidents. Parry, Veung, and Heine readily admit that estimates of these kinds of costs are squishy. They write: "Given the uncertainties and controversies involved in quantification (e.g., how to value health risks in different countries) these estimates are best viewed as a starting point for discussion though they are based on conservative assumptions ..." For example, these estimated additional costs of using carbon-based fuels may well be on the conservative side. As the authors point out, they do not include adjustments for the environmental costs of extracting, storing, and transporting such fuels, nor for costs of the heightened vulnerability to economic disruption that comes from reliance on these fuels. Here's a quick sketch of some of the main points in their argument. 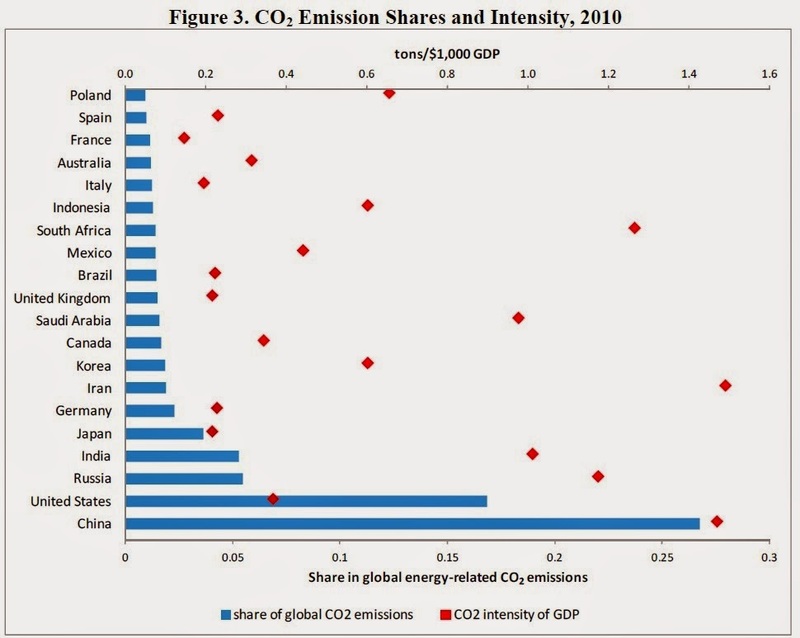 First, here's an overview of carbon dioxide emissions for the 20 countries that are the largest emitters of carbon. The solid blue bars show total emissions: thus, China leads the way, followed by the U.S., Russia, India, and then Japan. The red diamonds show "intensity" of emissions, which is the carbon emissions relative to GDP. Here, emerging market economies where manufacturing is a bigger part of the economy and emissions standards are typically lower often look worse that higher-income countries. 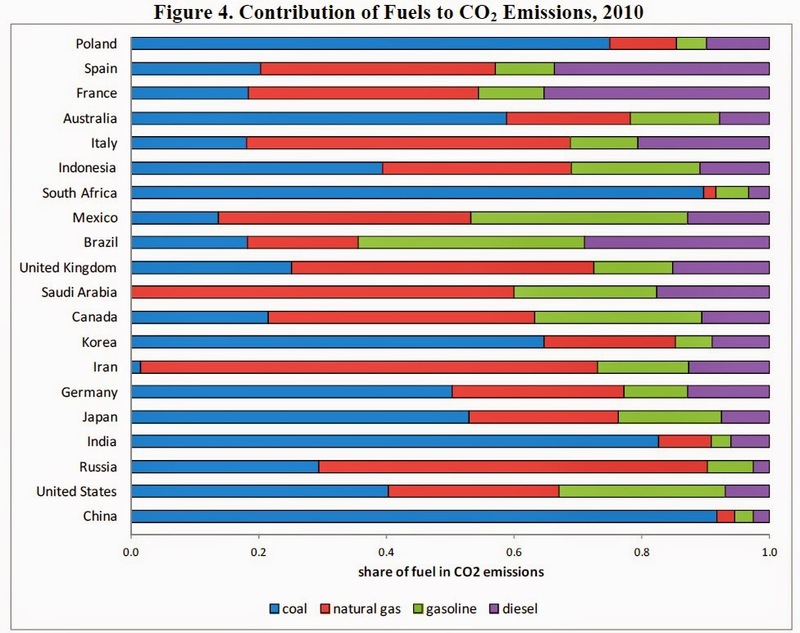 Here's a related figure showing for each country how much the main fossil fuels contribute to carbon emissions. For example, notice the very large role played by coal in China and India, the larger role for natural gas in Russia, and the relatively larger role for gasoline and diesel in the United States. 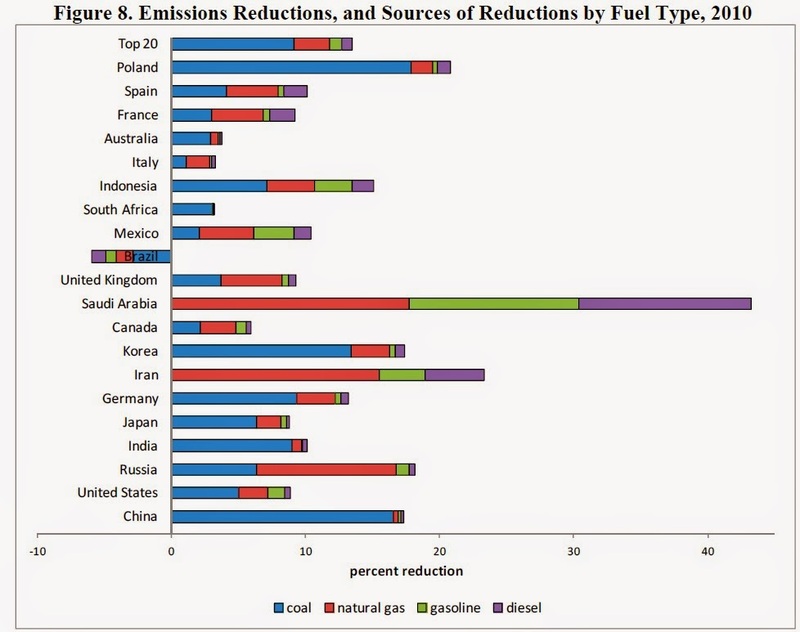 Clearly, efforts to reduce carbon emissions would have different effects on fuel sources across countries. Of course, as the authors note, these kinds of estimates should not be taken as precise. But I sometimes worry that with all the attention paid to climate change issues, pro and con, the old-fashioned problem of reducing conventional air pollutants gets too little attention. I'll add that carbon is not the only greenhouse gas, nor is it the only emission where the argument based on co-benefits is worth attention. For example, soot and methane are also air pollution problems that are implicated in climate change, but where reducing them would have also have immediate health effects. Other studies have shown that the costs of air pollution in the U.S. are high even without taking long-term climate change issues into account. The costs of air pollution and other environmental hazards in China are very large. The World Health Organization reports that air pollution is overall the world's biggest health hazard, although only part of this is related to the energy sources that raise the risks of climate change. Those who are most deeply concerned about climate change may raise concerns that focusing on domestic gains from reducing air pollution will not ultimately be enough, and that efforts to reduce carbon emissions to address climate change must go further. But the immediate issue is not what air pollution policies may need to be adopted in 2030 or 2060. If the case for reducing the use of carbon-based energy can be made right now, in terms of immediate health benefits, then that seems a useful starting point for discussion. Douglas Clement has a lively interview with Michael Woodford, appearing in the September 2014 issue of The Region, which is published by the Federal Reserve Bank of Minneapolis. Here are some comments from Woodford. I had specifically suggested that announcing a target path for nominal GDP would be a desirable way to make an advance statement about the criteria that you would be looking at later. Now, I wasn’t saying that to suggest that that’s the only formula that would be valuable, but I thought it was useful to give a concrete example showing how the thing that I was talking about could be undertaken in practice. ... A nominal GDP target path would have the advantage of being a single criterion, yet one that conveyed concern both about the real economy and about the price level and nominal variables at the same time. It would have given an explanation for which substantial stimulus would have continued to be appropriate for some time to come. But it was also a criterion that was intended to reassure people that what looked like very aggressive monetary policy wasnot going to allow inflation to get out of hand. If inflation picked up very much, the FOMC would quickly have reached the nominal GDP target and then would have to restrain nominal demand growth in order not to shoot past the target path. The public wouldn’t have to be worried that we were pushing so hard on stimulating the economy that maybe we were going to let demand get totally out of control, and we were just not thinking about that because it wasn’t the fire that had to be put out this year. I think the fact that interest rates can be and are currently being paid on excess reserves is very important. Of course, the Fed asked for that authority from Congress back in 2008 before embarking on the large expansion in the size of its balance sheet. The reason, I think, is that it was preparing for this question that we are going to face within the next year or so: When you have this big balance sheet, have you given up control over short-term interest rates? The FOMC wanted to be sure the answer to that question was “no,” and it could do that by having the ability to pay whatever interest rate it deemed appropriate on those reserves. So that’s a very important tool, and probably the most important tool that they are going to have when the moment arises. Should the Federal Reserve have a mandate to pursue financial stability, along with full employment and a stable price level? The question whether there should also be a financial stability mandate is a more reasonable one to take up. Though I have to say that I find it a little surprising that people would think that there isn’t one. It’s true that the Federal Reserve Act mentions price stability, it mentions maximum employment and it doesn’t, in a similarly direct way, talk about the responsibility for financial stability. But, historically, if we ask why the Federal Reserve Act was passed at all, we know that Congress established the Fed in response to a financial crisis. From the legislative history, it’s clear that the whole point of the Federal Reserve Act was to have an institution that would act to ensure financial stability. It’s true that when the current language of the Federal Reserve Act was drafted in the 1970s, financial stability had become a less central concern, and instead inflation and unemployment were both big problems. Still, the idea that anyone would have thought that it was somehow not the Fed’s concern is strange. I find it hard to imagine that if the Fed thinks it should do something out of a concern for financial stability, anyone would actually be able to object that this was overstepping the bounds of what Congress ever wanted it to be concerned with. ... I don’t see anything wrong with making it more explicit. It’s just that it seems to me that an amendment of the act to do this would be fixing something that isn’t really a problem. 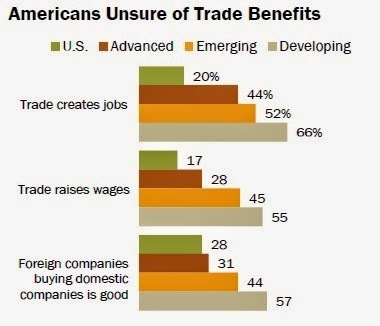 Americans, who are sometimes caricatured as being especially supportive of free trade, are actually among those most opposed. People from the low-income countries of the world, far from feeling oppressed by international trade, are often among its stronger supporters. The Pew Research Center has a new survey out--"Faith and Skepticism about Trade, Foreign Investment"--on the responses of people in 44 nations to questions about the effects and consequences of international trade. Here is a sampling of the evidence. People from low-income countries The populations who are typically most in favor of free trade are those from low-income countries. Peru, Philippines, Poland, Russia, South Africa, Thailand, Tunisia, Turkey, Ukraine, Venezuela & Vietnam. Developing economies include Bangladesh, El Salvador, Ghana, Kenya, Nicaragua, the Palestinian territories, Senegal, Tanzania & Uganda." As the report notes: "Some of the greatest public skepticism about trade and foreign investment is found in the United States." Here are some examples. The U.S. is below other advanced economies, and far below the emerging and developing countries, in the share of the population who believes that trade creates jobs or raises wages. 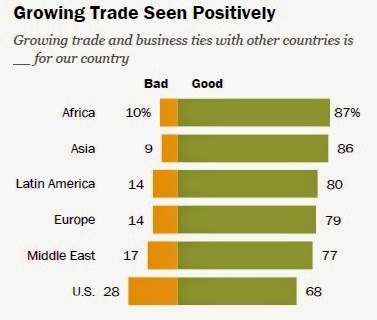 In the U.S., the share of people who see growing trade and business ties with other countries as good is lower than in regions across the world. Again, this isn't just a U.S. phenomenon. In general, high-income countries across the world are more skeptical of trade than emerging and developing countries. Here's a country-by-country breakdown of the responses on whether trade with other countries helps jobs and wages. Economists can argue all they want about the benefits and costs and trade-offs of free trade, but public opinion will play an important role in the extent to which trade can flourish. One obvious response to these kinds of survey answers is to say something like: "Well, of course those from low-income countries are more in favor of free trade. They are the ones gaining jobs and economic growth from free trade, while high-income countries suffer." Before swallowing this argument too quickly, it's worth remembering that some off the protesters who make the argument used to argue the exact opposite not that long ago: that is, they used to argue that international trade is a process where the high-income countries of the world are exploiting the rest of the world. Indeed, at least some of the anti-globalization protesters like to believe that they are speaking for the poor and oppressed of the world, but at least on the topic of international trade, the poor of the world seem to want more international trade, not less. As an economist, I believe that international trade is not a zero-sum game, but through its competition and challenges and, yes, its disruptions, trade offers overall benefits for all the nations participating. I won't argue that case here: if you want to look at some of my past blog posts on international trade issues, you can start with posts on global supply chains (here and here), the growth of trade in services, the importance of trade within regions for economic growth, shifting patterns of global trade, the "hyperglobalization" of world trade, raising U.S. exports, and finally some discussion of international trade in iPods and in apples--the fruit. But what I will say is that in the next few decades, the most rapid growth in the global economy is going to be happening in emerging market economies from China and east Asia, to India and south Asia, to Latin America, eastern Europe, and even Africa. Trade between these countries is going to expand as well, driven in part by political agreements but driven even more by economic opportunities, and by the falling costs of transporting value between countries--whether that value travels by container shipments and airplanes, or by way of information and communications technology. The U.S. and other high-income countries do not control this process. The practical and non-ideological question is whether the U.S. and other high-income countries find ways to hook up their economies to the growth engines of the world economy, so that their workers and standard of living can benefit from that growth, or whether that opportunity is fumbled and missed. The U.S. Census Bureau has just published its annual report with estimates of the U.S. poverty rate, which was 14.5% in 2013, down a touch from 15.0% in 2012. It's easy to have sympathy for those with low incomes. But for many of us, myself included, true empathy with the one-seventh or so of Americans who are below the poverty line is more difficult. It can be difficult to avoid falling into easy and ill-informed moralizing that if those with low incomes just managed their food budget a little better, or saved a little bit of money, worked a few more hours, or avoided taking out that high-interest loan, then their economic lives could be more stable and their longer-term prospects improved. In modern times, we have Americanized the "fish and chips standard" into "burger and fries," but the notion of the poor living through sports and pop culture, mediated through electronic devices, still has an uncomfortably contemporary ring. In some ways, the issue of empathizing with the poor comes down to this: Is some of the seemingly dysfunctional behavior associated with poverty (say, low savings, poor diet, or certain kinds of risk-taking behavior) a result of poverty, or is it a reason why people ended up in poverty. An accumulating body of evidence suggests that being confronted with poverty leads to characteristic psychological reactions that can make it hard to escape from poverty. short-sighted and risk-averse decision-making, possibly by limiting attention and favoring habitual behaviors at the expense of goal-directed ones. Together, these relationships may constitute a feedback loop that contributes to the perpetuation of poverty." You can get some people to sympathize with the poor, but to empathize is actually very hard, because most people are not poor. I realized that scarcity gives you a thread. You can understand some behaviors of your own that you experience under scarcity, and you can almost follow that thread and say, "I can at least imagine what that scarcity must be like if it were really unrelenting." This allows you to almost project yourself more into people’s shoes, and therefore to gain a richer understanding of a world which many of us don't otherwise have access to. Mullainathan has carried out some interesting structured games in which some players turn out to be comparatively rich while others are comparative poor. The games are hypothetical settings, of course. But intriguingly, those who turn out to be poor in the game become much more willing to borrow at unfavorable conditions--even though it makes them worse off in the long run. For my own part, my life often feels as if I am perpetually experiencing a shortage of time. Somehow, the tasks of life get done. But why can't I do a better job of working especially hard for a few months or a year, and then getting well ahead of my work? Surely, it would be a more relaxed and pleasant life if I didn't live from one deadline to the next?!? But I usually fail at saving up time and getting ahead in this way--just as those who are confronted with a shortage of income often fail to try extra-hard to save for a time, to ease what is otherwise an ongoing financial crunch. If you compare my own behavior in living deadline to deadline under a shortage of time, and the behavior of a low-income person in living check to check with a shortage of income, some of the patterns look much the same. In social science parlance, a "free rider" is someone who benefits from a collectively provided good but does not make an appropriate contribution to the provision of that good. A homely example might be the family that shows up each year empty-handed at the big reunion, planning just to eat what all the other families provides. In an introductory economics class, the idea of a free rider often arises the discussion of public goods, referring to the idea that self-interest can lead people to a wish to benefit from collective--often government--goods and services, without contributing an appropriate share. Of course, if many people behave in this way, collective action can become difficult to sustain. The meaning of "free rider" has evolved over time, until terminologysort of popped up in the economics literature. Philippe Fontaine explores earlier and current uses of "Free Riding" in the September 2014 issue of the Journal of the History of Economic Thought (v. 36, pp 359-376). The journal isn't freely available on-line, but many readers will have access through library subscriptions. Fontaine discusses two main uses of "free rider" in economics leading up to the 1960s: one in the context of securities practices and the other in the context of labor unions. The NASD [National Association of Securities Dealers] likewise prohibited the practice of free riding “hot issues.” Here, professionals who had withheld shares from the public at the initial public offering were castigated for selling them with a significant profit in the trading market afterwards. From the mid-1960s, free riding was used to describe “the practice of purchasing during distribution and selling after a subsequent rise in price in the aftermarket.” Though not illegal, this practice was forbidden by the NASD because the broker-dealer was not supposed to enjoy “an unfair advantage from his position as a distributor of securities.” ... For its proponents, regulation of the securities market was justified by the need to defend the interests of the public against unfair practices and free riding in particular, while, for its adversaries, this regulation appeared as an obstacle to access a supposedly open market. When did the free rider terminology jump from being specific to a financial or a labor union context, and become a general term widely used by economists? The answer here turns out to be trickier than one might expect. Suppose that the local swamp requires draining to eliminate or reduce mosquito breeding. Let us postulate that no single citizen in the community has sufficient incentive to finance the costs of this essentially indivisible operation. Defined in the narrow, orthodox way, the "market" fails: bilateral behavior of buyers and sellers does not remove the nuisance. ... This is, however, surely an overly restricted concept of market behavior. If the market institutions, defined so narrowly, will not work, they will not meet individual objectives. Individual citizens will be led, because of the same propensity, to search voluntarily for more inclusive trading or exchange arrangements. A more complex institution may emerge to drain the swamp. The task of an economist includes the study of all such cooperative trading arrangements which become merely extensions of markets as more restrictively defined. I have not got out of all the difficulties yet, however. You may ask: "Will it really be to the interest of any single citizen to contribute to the voluntary program of mosquito control? How is the "free rider" problem to be handled? This spectre of the "free rider," found in many shapes and forms in the literature of modern public finance theory, must be carefully examined. ... There may be cases where the expected benefits of the draining are not sufficiently high to warrant the emergence of some voluntary cooperative arrangement. And, in addition, the known or predicted presence of free riders may inhibit the cooperation of individuals who would otherwise contribute. ... Hence, the "market," even in its most extended sense, may be said to "fail." What recourse is left for the individual in this case? It is surely that of transferring, again voluntarily, at least at some ultimate constitutional level, activities of the swamp-clearing sort to the community as a collective unit, with decisions delegated to specifically designated rules for making choices, and these decisions coercively enforced once they are made. Therefore, in the most general sense (perhaps too general for most of you to accept), the approach to economics that I am advancing extends to cover the emergence of a political constitution. As Fontaine notes, "Buchanan maintained that the “‘free rider’ problem” could be “found in many shapes and forms in the literature of modern public finance theory. That was true, indeed, but the phrase free rider problem was no part of public finance language. No mention was made of the free-rider problem or free riding in [Buchanan's book] The Calculus of Consent of 1962." However, Buchanan had read pre-publication drafts of Olson's Logic of Collective Action, which explores the dynamics of what came to be called free riders in detail, and Buchanan apparently brought the term over from its earlier applications to labor unions and securities regulation. As in Buchanan's explanation, it is straightforward to use the idea of a "free rider" as a justification for why people form governments and give them legal power to collect taxes. But the notion of the free rider developed a little further in the 1960s, in a way with less clear justifications for government. Olson explained near the start of the Logic for Collective Action, "[A]ny group or organization, large or small, works for some collective benefit that by its very nature will benefit all of the members of the group in question. Though all of the members of the group therefore have a common interest in obtaining this collective benefit, they have no common interest in paying the cost of providing that collective good. Each would prefer that the others pay the entire cost, and ordinarily would get any benefit provided whether he had borne part of the cost or not." [T]he free-rider problem was above all a theoretical construct, the logical basis of which rested on group size. The main difference between small- and large-number settings was that, in the former, individuals might see their action as exerting some influence on others and their lack of contribution as making a difference, which might cause them to contribute. In the large-number settings, by contrast, the individual believed that others would compensate for his or her lack of contribution—hence, free riding. In other words, the problems posed by free riding had little to do with the weakening of moral norms and they could not, therefore, be solved by simply urging people to improve; rather, they betrayed the increasing permeation of society by self-interest—taken as a rule for behavior—as a result of social change and, in particular, the increase in group size. If free riding was a rational response to certain circumstances, then it was for policy makers to help change the environment in such as way as to make it less conducive to such behavior and for social scientists to convince them that they knew what ought to be done. still." They discuss these issues in "Monnet’s Error?" presented as part of the Fall 2014 conference of the Brookings Papers on Economic Activity. For non-EU readers, Monnet is Jean Monnet, a French diplomat who was one of the leaders of the movement toward European Union. Monnet died in 1979, but back in the early 1950s, he was President of the European Coal and Steel Community, the first forerunners of what eventually grew into the modern European Union. The functionalist view, advanced by Jean Monnet, assumes that moving some policy functions to the supranational level will create pressure for more integration through both positive feedback loops (as voters realize the benefits of integrating some functions and will want to integrate more) and negative ones (as partial integration leads to inconsistencies that force further integration). In the functionalists’ view integration is the result of a democratic process, but the product of an enlightened elite’s effort. In its desire to push forward the European agenda, this élite accept to make unsustainable integration steps, in the hope that future crises will force further integration. In the words of Padoa-Schioppa (2004, p. 14), a passionate Europe-supporter who espoused this theory, “[T]he road toward the single currency looks like a chain reaction in which each step resolved a preexisting contradiction and generated a new one that in turn required a further step forward. ... In the words of Romano Prodi, one of these founding fathers, "I am sure the euro will oblige us to introduce a new set of economic policy instruments. It is politically impossible to propose that now. But some day there will be a crisis and new instruments will be created." As Guiso, Sapienza, and Zingales note, the "functionalist approach implicitly assumes that there is no risk of a backlash." The past history of the EU project, along with the present experience of the euro, raise questions about whether Monnet's functionalist ratchet may be hitting its limits. with all the countries (except Italy) having a pro Euro majority." On the one hand, Monnet’s chain reaction theory seems to have worked. In spite of limited support in some countries, European integration has moved forward and has become almost irreversible. On the other hand, the strategy has worked so far at the cost of jeopardizing the future sustainability. The key word is “almost.” Europe and the euro are not irreversible, they are simply very costly to revert. As long as the political dissension is not large enough, Monnet’s chain reaction theory delivered the desired outcome, albeit in a very non-democratic way. The risk of a dramatic reversal, however, is real. The European project could probably survive a United Kingdom’s exit, but it would not survive the exit of a country from the euro, especially if that exit is not so costly as everybody anticipates. The risk is that a collapse of the euro might bring also the collapse of many European institutions, like the free movement of capital, people and goods. In other words, as all chain reactions, also Monnet’s one has an hidden cost: the risk of a meltdown. For some earlier posts on the economics of the euro-zone, see "A Euro Narrative" (August 15, 2013) and "Will We Look Back on the Euro as a Mistake?" (February 28, 2014). Coda: From a U.S. policy perspective, the most recent application of the functionalist view is probably the Patient Protection and Affordable Care Act that President Obama signed into law in 2010. Even those who supported the law four years ago are quick to acknowledge that it has all sorts of flaws and shortcomings, which of course is why the Obama administration has delayed or redefined so many substantial provisions over time. But to many supporters, the details of the law seem less relevant than the belief that a functionalist political ratchet is now in effect: that is, any successes of the law will be a reason to continue the law, and any shortcomings of the law will be an additional reason for federal intervention in the health care industry to address those shortcomings. For example, President Obama has spoken supportively of a single-payer health care system over time, but has also discussed the transitional difficulties that could arise from moving in that direction too rapidly. Many opponents of course dislike the substance of the law, but my guess is that many opponents would not be so concerned over, say, state-level health insurance exchanges aimed at providing insurance to the uninsured, if they didn't fear that it was part of a ratchet effect for future federal control over the health care industry. Similarly, my sense is that many of the arguments over the appropriate military stance for the United States in the Middle East are less about what immediate steps should be taken, but instead about either the hope by some, or the fear by others, that those immediate steps will lead to a ratchet effect of additional military steps in the future. Each year the Department of Economic and Social Affairs at the United Nations publishes a "Concise Report on the World Population Situation." 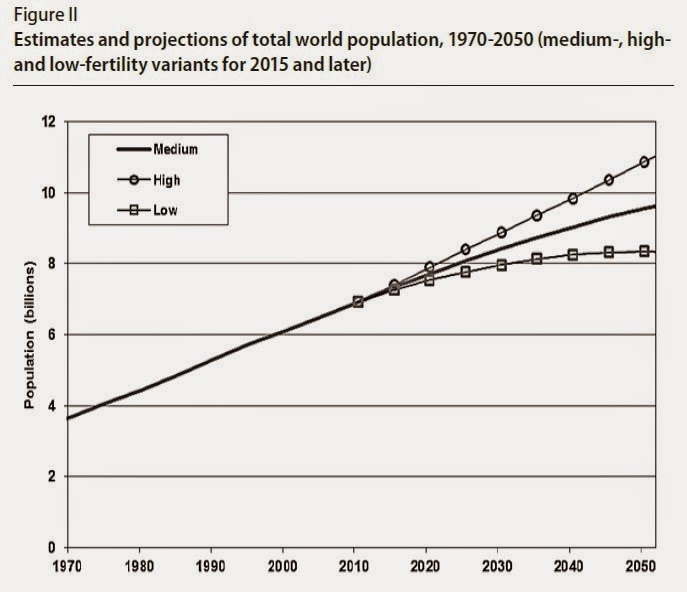 The 2014 report is a chance for a quick check on the numbers, fertility, of the human race. As a starting point, here are global population projections through 2050. The high-fertility estimate is when women have on average a half-child more, and the low-fertility estimate is when women have on average a half-child less. As your eye shows, the rate of increase in population is slowing a bit over time. Here's a figure breaking down the average population growth rates for the world and by by region. 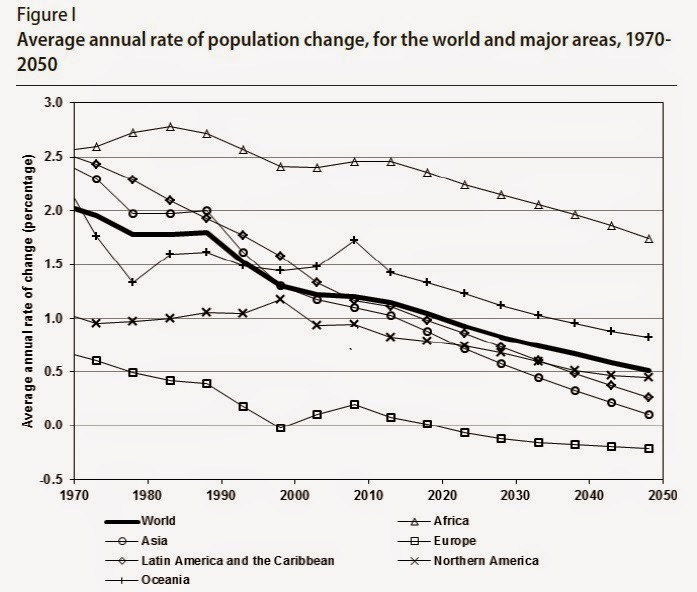 For the world, population growth rates are projected to fall from 2% in 1970 to 0.5% by 2050. For Europe, population growth rates are at zero percent now, and slated to fall lower. A number of other regions are headed that way as well, with population growth in Africa the clear outlier. The report notes: "[T]the annual increase in that populationhas been declining since the late 1960s. By 2050, it is expected that the world’s population will be growing by 49 million people per year, more than half of whom will live in the least developed countries. Currently, of the 82 million people added to the world’s population every year, 54 per cent are in Asia and 33 per cent in Africa. By 2050, however, more than 80 per cent of the global increase will take place in Africa, with only 12 per cent in Asia." 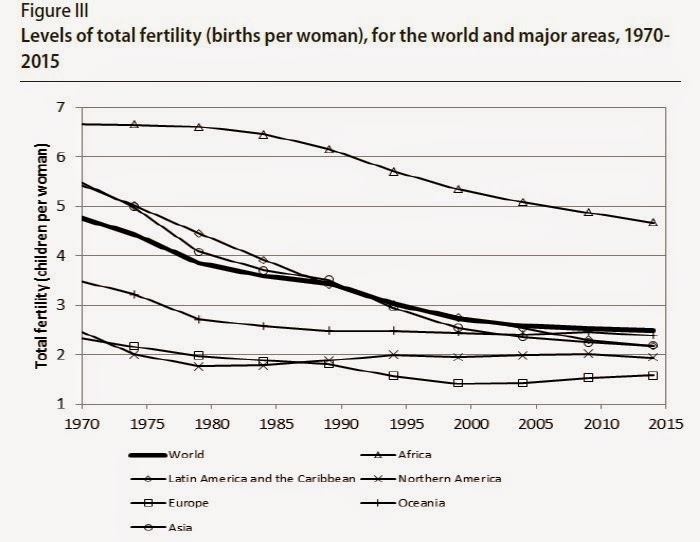 These lower rates of population growth are reflected in lower fertility rates. Back in 1970, only Europe and Northern America had fewer than three births per woman. Now the world average is less than three births per woman, although Africa's rate remains higher. Still, Africa's birthrate per woman roughly matches where Latin America and Asia were in the late 1970s, and fertility rates can in some cases shift quite rapidly. People are living longer. 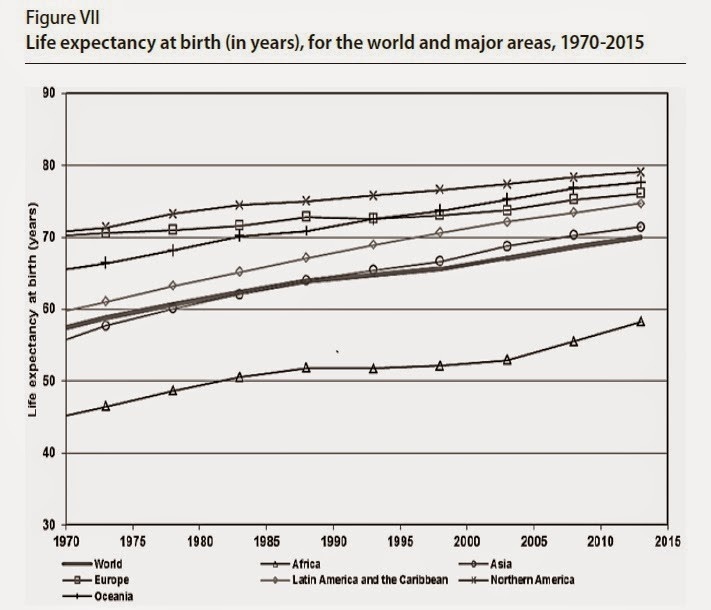 For the world as a whole, life expectancies are up from less than 60 years in 1970 to about 70 years now. The disparity in life expectancies is much smaller than the disparity in incomes. A person in a high-income country may have 10 or 20 times as much income as someone in a low-income country, but they don't live 10 or 20 times longer. Indeed, much of the remaining disparity in life expectancy happens not in old age, but among children. For the world as a while, about one child in every five died before reaching the age of 5 back in the 1950s. Now, only about one child in 20 dies before reaching the age of five. 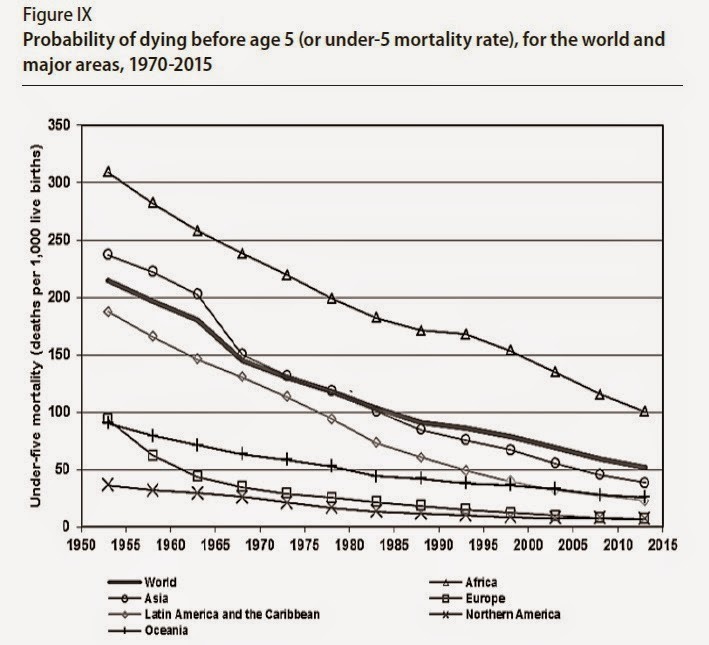 Even in Africa, the under-5 infant mortality rate has dropped to what the world average was as recently as the early 1980s. These figures are all telling us something about how the typical or common life experience of a member of the human race is changing over time. In many countries of the world, population may move to different locations, but population is growing by little or nothing. Nuclear families are smaller. Women are spending less time pregnant, but when children are born, the parents are far less likely to face the tragedy of an early death (which of course could make such tragedies feel even more painful when they do occur). With longer life expectancies and smaller families, a giant family reunion in modern times is less likely to have a few older people and a swarm of children than the equivalent event a few decades ago. Instead, the attendees at that giant family reunion may be distributed fairly evenly across four generations. In these and other ways, our fundamental feelings about what seems usual and common in our families and communities is fundamentally different from previous generations of the human race.